Truffles, bitter cocoa, and milky smooth squares — on the next Vermont Edition, we’re celebrating chocolate. We’ll talk with a few small-scale chocolatiers in our region about the craft and tradition of handmade chocolates. 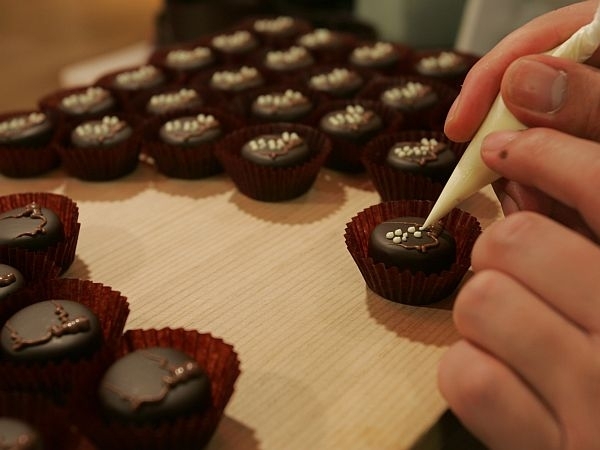 We learn about tempering chocolate, hand-rolling candies, and making delectable ganache. And we talk about how chocolate evokes nostalgia and devotion in our taste buds. Our guests are Jen Roberts of Daily Chocolate in Vergennes, Linda Grishman of Sweet on Vermont Artisan Confections in Burlington and Sharon Wintersteen of Snowflake Chocolates in Jericho. Plus, VPR’s Bob Kinzel analyzes Vermont Attorney General Bill Sorrell’s decision not to file suit against top Entergy executives for misstatements about underground pipes. We also discuss the Vermont congressional delegation’s position on raising the U.S. debt ceiling and a new survey by the Vermont Business Roundtable that shows job growth holding steady through the rest of the year. A lesson from Middlebury Chocolates on what it takes to turn an unassuming cocoa bean into a delectable truffle.